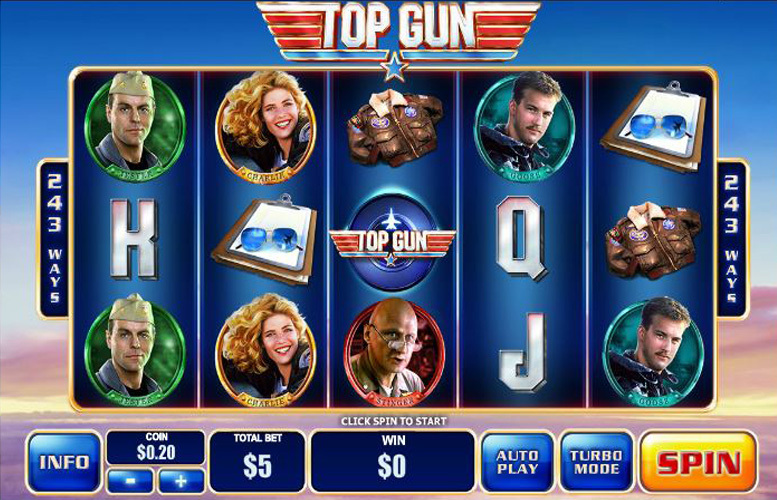 Of course, the Top Gun slot machine from veterans of the industry Playtech is based on the movie of the same title. It features music from the original motion picture, as well as many of the memorable characters from the classic military aviation flick. The jackpots and betting limits might not be the highest around on this five reel, three row machine but the game’s excellent bonus features do negate this somewhat. So, let’s get right into the danger zone and see what Playtech have for us this time. 243 ways to win. It might not make a massive difference to the gameplay dynamics but small features like alternate takes on win line structures make titles like Top Gun feel fresh when compared with standard 20, and 40 win line machines. Two great special features. 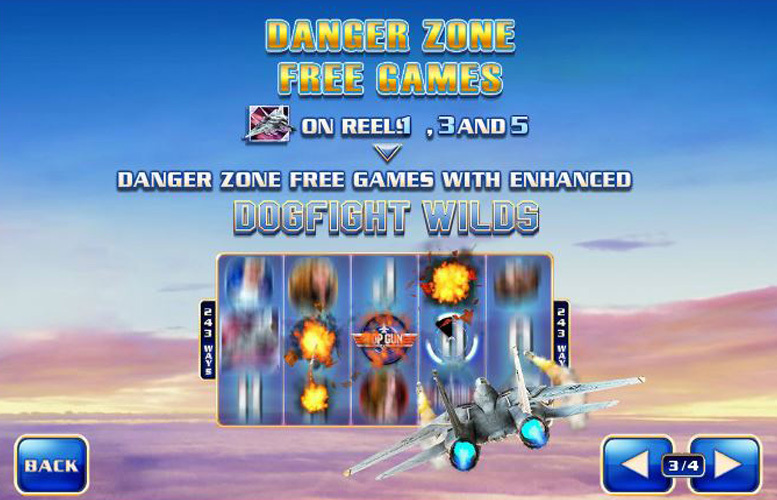 The Danger Zone Free Games, and the Dogfight Wilds make gameplay varied whilst more importantly increasing the potential for big wins. Rather low main game prizes. Some machines offer five-figure sums. The paltry 1,500x the total bet base game jackpot hardly compares in this respect. Unimpressive upper betting limit. £250 per spin is a lot for most players but there are some who are wanting to wage much more. Such gamers would be better served elsewhere. Game logo “wild” symbol = 1,500x the total bet. Charlie = 1,000x the total bet. Slider, or Jester = 150x the total bet. Iceman, or Goose = 500x the total bet. Pilot gear = 100x the total bet. 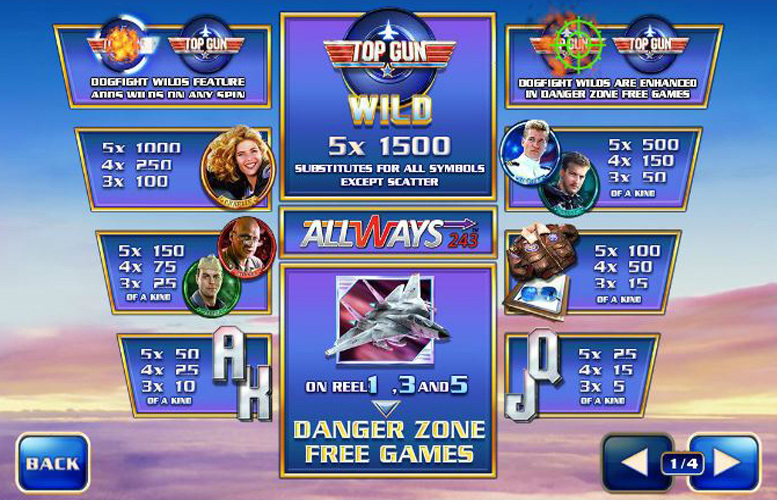 The game features on Top Gun are a bit of a mixed bag. They’re certainly lucrative but they don’t engage the player as much as those found in some of the title’s peers. Dogfight Wilds occur randomly during the main game. On every spin, players are awarded between one and 15 wilds. These appears in random spots upon the reel, and can add up to some massive prizes. Landing the jet symbol on reels one, three, and five simultaneously will trigger the Danger Zone Free Games. 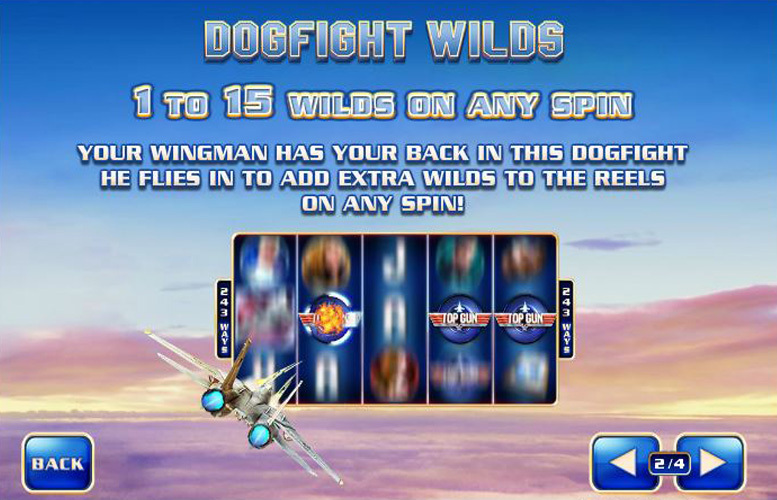 Players will receive eight free spins and during them, additional Dog Fight Wilds will appear, making for even more chances to win. Ace, or King = 50x the total bet. Queen, or Jack = 25x the total bet. Players are only given one option to adjust their betting spread on Top Gear. They can vary the amount bet per spin alone. 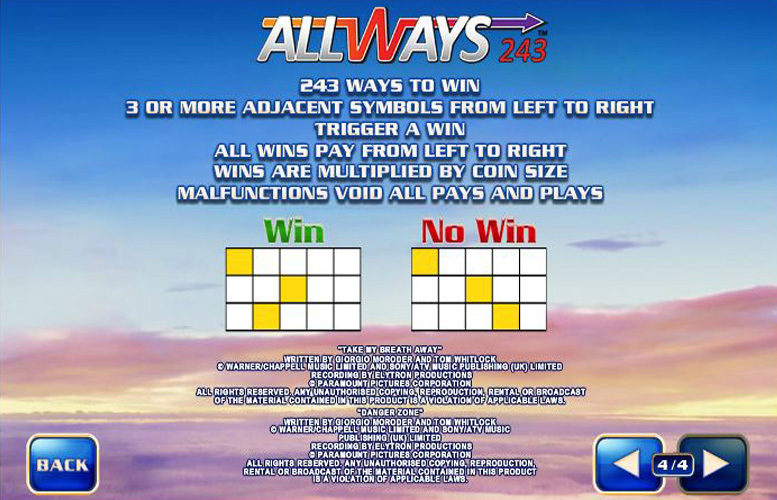 This is because the machine uses the 243 ways to win and as such a wager “per line” isn’t possible to work out. The minimum bet per spin is set at 25p, and the maximum at £250. Whilst this is more than enough to suit most budgets, some machines offer 20x this upper limit. Clearly, Top Gun is not for those with the largest bankrolls. The Top Gear slot machine from Playtech is a solid effort, and a worthy game to pass some time with. It’s not quite as feature-rich as many of its contemporaries but its fond reminiscing of a classic movie will certainly win it fans regardless. As is important for slots based on franchised material, it stays very true to the subject matter, and the short bursts of “Take My Breath Away” and Kenny Loggins’s “Danger Zone” will no doubt bring a smile to avid aviation nerds and fans of great cinema’s faces. This game has a rating of 4 / 5 with 352 total reviews by the users.